Police said a man who was found unresponsive on the Wellington Brown Line station platform early Saturday had been robbed by a group of people as he waited for a train. No one is in custody. Officers responded to a call of a battery victim down with a head injury at the station, 945 West Wellington, around 12:45 a.m. The victim later told officers that a group of people approached him on the platform and punched him, causing him to fall down and rendering him unconscious. The offenders took the victim’s valuables and left the area before police arrived, authorities said. An ambulance transported the man to Advocate Illinois Masonic Medical Center where he was treated and released. A police spokesman did not have any description available for the offenders. Area North detectives are investigating. 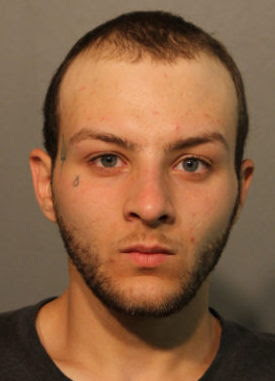 A convicted robbery offender who calls a local service agency “home,” is charged with snatching money from a 43-year-old man in Wrigleyville and then punching the victim in the face when he chased after him. The victim was in the 900 block of West Addison around 7:50 p.m. on August 3rd when Shawn Dodd grabbed cash from his hand and then fled, according to police. When the victim caught up with Dodd outside of Wrigley Field, Dodd punched the man in the face and ran northbound on Sheffield, police said. Cubs security reviewed video that showed Dodd entering a bar in the 3900 block of North Sheffield moments after the confrontation. Police arrested him there. Dodd, 22, was charged with misdemeanor battery and misdemeanor theft. Felony robbery charges were declined. Judge David Navarro set Dodd’s bail at $5,000. In February 2016, Dodd pleaded guilty to punching a 53-year-old woman and robbing her of $30 in the 5900 block of North Kenmore the previous September. He was sentenced to three years in prison, but Judge William Lacy recommended Dodd for an alternative boot camp program. On his most recent arrest report, Dodd lists the Howard Brown Health Center at 4025 North Sheridan his home.